I’ve been trying to figure out for over a year how to make images like the one above, without having holes in the two polyhedra, facing each other. At last, that puzzle of polyhedral manipulation using Stella 4d (software available at this website) has been solved: use augmentation followed by faceting, rather than augmentation followed by simply hiding faces. Both of these were made using Stella 4d, software you can try at this website. If these thin edges are then thickened into cylinders, that makes a third way to depict this polyhedral compound. It creates a minor problem, though: edges-as-cylinders looks awful without vertices shown as well, and the best way I have found to depict vertices, in this situation, is with spheres. With vertices shown as spheres, however, a sixth color, only for the vertex-spheres, is needed. Why? Because each vertex is shared by six edges: three from a cube of one color, and three from a second cube, of a different color. Finally, here are all three versions, side-by-side for comparison, and with the motion stopped. All images in this post were created using Stella 4d: Polyhedron Navigator, software you may try for free at this website. Various Views of Three Different Polyhedral Compounds: Those of (1) Five Cuboctahedra, (2) Five of Its Dual, the Rhombic Dodecahedron, and (3) Ten Components — Five Each, of Both Polyhedra. Polyhedral compounds differ in the amount of effort needed to understand their internal structure, as well as the way the compounds’ components are assembled, relative to each other. This compound, the compound of five cuboctahedra, and those related to it, offer challenges not offered by all polyhedral compounds, especially those which are well-known. The image above (made with Stella 4d, as are others in this post — software available here) is colored in the traditional style for compounds: each of the five cuboctahedra is assigned a color of its own. There’s a problem with this, however, and it is related to the triangular faces, due to the fact that these faces appear in coplanar pairs, each from a different component of the compound. The yellow regions above are from a triangular face of the yellow component, while the blue regions are from a blue triangular face. 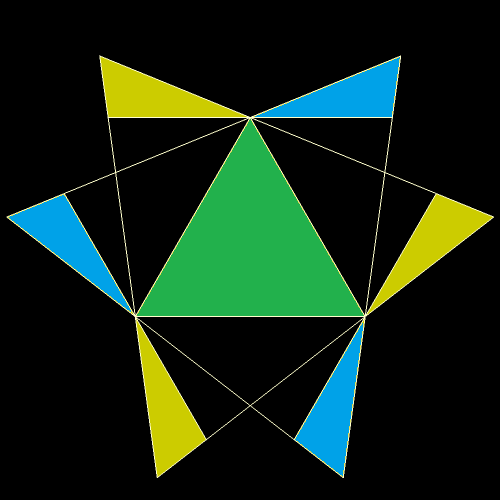 The equilateral triangle in the center, being part of both the yellow and blue components, must be assigned a “compromise color” — in this case, green. The necessity of such compromise-colors can make understanding the compound by examination of an image more difficult than it with with, say, the compound of five cubes (not shown, but you can see it here, if you wish). Therefore, I decided to look at this another way: coloring each face of the five-cuboctahedra compound by face type, instead of by component. Another helpful view may be created by simply hiding all the faces, revealing internal structure which was previously obscured. Since the dual of the cuboctahedron is the rhombic dodecahedron, the dual of the compound above is the compound of five rhombic dodecahedra, shown, first, colored by giving each component a different color. Why wasn’t it helpful? Simple: all sixty faces are of the same type. It can be made more attractive by putting Stella 4d into “rainbow color” mode, but I cannot claim that helps with comprehension of the compound. With this compound, what’s really needed is a “ball-and-stick” model, with the faces hidden to reveal the compound’s inner structure. Since the two five-part compounds above are duals, they can also be combined to form a ten-part compound: that of five cuboctahedra and five rhombic dodecahedra. In the first image below, each of the ten components is assigned its own color. In this ten-part compound, the coloring-problem caused in the first image in this post, coplanar and overlapping triangles of different colors, vanishes, for those regions of overlap are hidden in the ten-part compound’s interior. This is one reason why this coloring-scheme is the one I find the most helpful, for this ten-part compound (unlike the two five-part compounds above). However, so that readers may make this choice for themselves, two other versions are shown below, starting with coloring by face type. Finally, the hollow version of this ten-part compound. This is only a personal opinion, but I do not find this image quite as helpful as was the case with the five-part compounds described above. Which of these images do you find most illuminating? As always, comments are welcome. Created using Stella 4d: Polyhedron Navigator, software which is available for either purchase, or a free trial download, right here. Teaching in Central Arkansas? Here’s a Key to Acronyms in Common Use in Our Profession. For the full list, please follow this link. This site was compiled by teachers. While we have strived for accuracy, we cannot guarantee that this alphabetized list is free from error. It is also not intended to represent the viewpoints of our employers, nor any other organizations. Its purpose is simply to help teachers, especially those new to the profession in our area, navigate education-related “acronym soup.” Suggestions for additions, corrections, or clarifications are welcome — simply leave them in a comment, below.